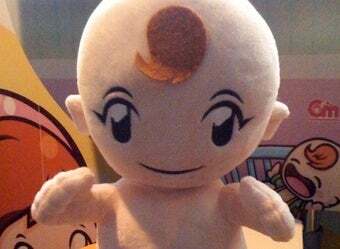 UGO's Tracey John got a plush baby in her arms at E3. The baby contained a Wii Remote, the better to let her control Babysitting Mama. She reports that manufacturing costs will limit the "controller" color to Caucasian-only. But in the game you will be able to babysit a baby of one of six different ethnic hues. Oh, when progressive design meets doll-manufacturing prices. In Babysitting Mama, you can rock the baby, play peek-a-boo and so much more. Add this to the reasons I wish E3 was a day longer. I would have loved to have played this. After all, E3 did have a lot of conventional games. Lots of shooters. Not many baby-rocking games.